I'll list the basics I believe the game design needs to get started, and briefly brainstorm on each to see what kind of system I should be trying. Honestly, I'm not too sold on this for this particular design. Giving differing stats and unique abilities to each character is fairly standard for my other designs, and what seems more appealing in a horror-themed strategy is to give each player equal starting points and seeing where they each take their dual effort to survive and win. But starting every game the same way, no matter what Character you're using, can get stale, and may seem lazy. 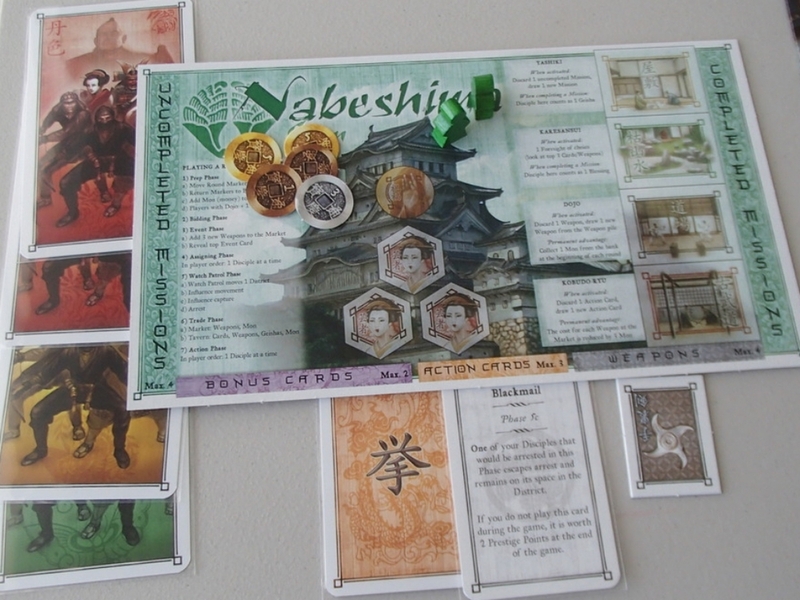 Variety at the start gives an inherent structure to each player's play strategy, which gives them different scenarios to try different tactics, and helps differentiate their characters' evolving narratives as the game unfolds. So my first suggestion to address this is to use a sort of mini-game as a part of setup for this game, that will determine the starting resources available to each player's character. Done right, this will ensure every player starts in a different game state, no one is handicapped, and the game gets partially setup through play, but characters can still just be flavor that doesn't necessitate separate stats or abilities. I'm thinking a sort of auctioning game should be used, with each player starting with an equal set of the different resources in the game, to determine who gets what map tiles to use when exploring or building the game map. Players that lose an auction keep their resources to use on the next round, while those that win put the spent resources off to the side. Once all tiles/a set number of tiles are bought, the spent resources are gathered together, randomly shuffled, and distributed evenly amongst the players. This should ensure relatively even resource distribution, but with varying resource types amongst the players. The stats in this game, while they could function similarly to stats in many others, should at least be themed separately from the typical stat-crunching boardgame fare. We don't need to track how strong your eccentric millionaire can punch a zombie's throat. Similarly, the oversimplified Lovecraftian Sanity trope in most horror boardgame fare may not be the right approach either. If the idea is these environments have turned hostile and are re-assembling themselves into a chaotic superstructure, well the board should reflect that to some degree. I think this necessitates a very modular tile design, which I'll have to figure out, that includes art of interiors from various "lairs," "labs," "mansions," etc. I like Tile Placement as a mechanic, and would like the players to have some agency in building the game board by playing tile they've collected. But there is also the consideration that this environment is supposed to be taking control away from these characters too. The idea of switching or moving tiles around the game board during play is thematically enticing, but in practice would almost undoubtedly become a laborious hassle. Additionally, considering the importance of the environment in this design, the tiles themselves should dictate some key elements of the game state other than simply navigation. Something such as resources or enemies or challenges should be marked on the tiles so that revealing or entering them bears some risk or cost. Aside from just control issues, there should be some form of constant threat being introduced or progressed against all players, which should be controlled by the game system itself. 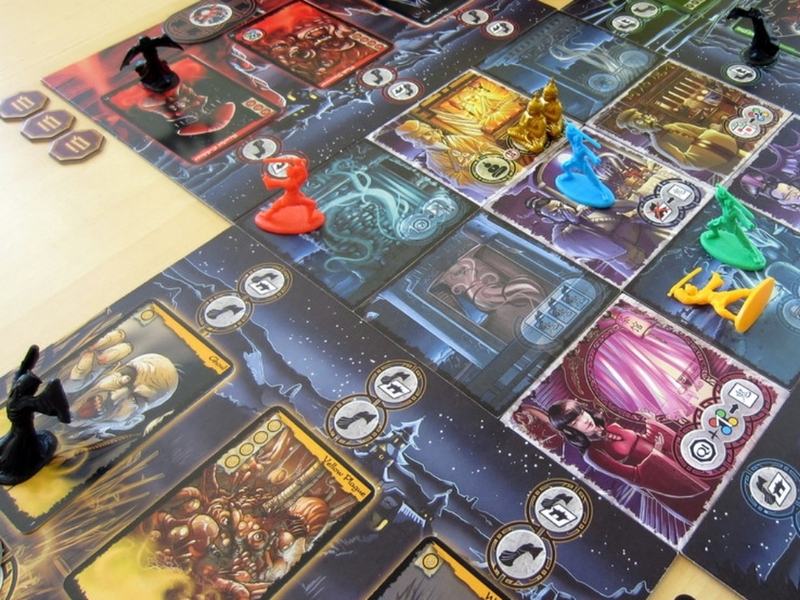 Again, care should be taken to avoid simply replicating basic dungeon-crawler boardgame AI, if at all possible. This AI "player" could be The Great Host that is creating this bizarre environment. As usual, I don't like Player Elimination. And while a large part of the tension in the horror genre comes from the uncertainty over who will survive, it's still not that great to be the early first victim, to have to sit by and watch the rest of your friends continue to have fun. Also, you can still create quite a similar sense of tension over not losing a character into which you've placed an investment of time, effort, and perhaps emotional attachment. I think there could be the possibility for either players coming back as another character, or taking control of normally board-controlled elements of the game to play as the hostile environment. Perhaps the first eliminated player gets to be The Great Host while subsequently eliminated players simply control minions of The Great Host? Or come back as another character? This likely depends on the victory conditions. Surprises and twists tend to be prerequisites in horror, or at least suspense. Having your victory conditions unclear at the start can add to things like the panic in intense situations or difficult choices. On the flip side, it can be frustrating wandering around an unknown environment with no objective. The opening half of most games of Betrayal at House on the Hill tend to be painfully dull and random, with little-to-no choices to make. While in media res type beginnings can be a great solution for a lot of games, to jump right into the action, there is some amount of tension that you need to build in any horror-themed outing before things really break bad. There does need to be a brief period at the start for new players to get some idea of the basic rules before throwing them into locked corridors with rabid lycanthropes on either end. So there are some choices to make here in terms of when, where, and how clearly the victory conditions for each player emerge in a playthrough, and how the period before that can still be interesting and engaging. Additionally, I should consider variant modes: one where players start the game with the map, building it as they explore; and one where players play a small mini-game to quickly build the whole map at the start, before beginning play in earnest. There could also be some element of the variant to set victory conditions earlier/at the start. Needless to say, there's a lot to consider here, and a lot of potential ways to go about it. My next steps will likely be to approach the combination Stat/Resource system, which will hopefully lead me towards Victory Conditions, Actions, and Map-making. All the while, I'll need to be thinking about the AI-controlled elements of the design, to ensure that's at all feasible without making things too slow and tedious every round.